Trade show graphics and displays, especially those used for multiple shows, should be laminated with a durable film to enhance the look and protect your investment. 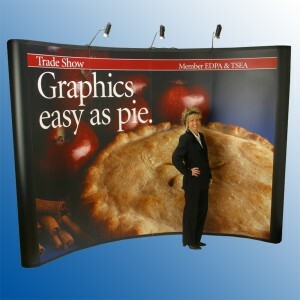 Trade show displays are frequently laminated with a matte film to reduce the glare caused by harsh and unflattering overhead lighting. 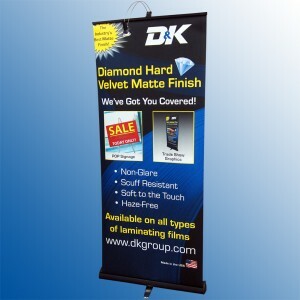 A textured matte finish or D&K’s Diamond Hard Velvet Matte Finish are ideal for impressive displays that are easy to read and stand out in a crowd. A laminating film also protects graphics during shipping, installation, and tear down – not to mention any incidental touching or bumping from booth staff and visitors.Vinyl and Polyester laminating films are an economical choice for trade show displays. For the ultimate durable finish, use a Polycarbonate film that offers rigidity, scratch resistance, and a soft velvet look. Retractable banners are prone to scratching when the graphic is pulled out of the stand base or retracted back in for storage and transportation. The face of the display should be protected with a thin laminating film that allows the graphic to roll up and fit in the base. Retractable banners can typically accommodate a total graphic thickness of 15 mils. Laminating films that are 3 mils or less are ideal for this application, although 5 and 6 mil films are compatible with some retractable banner models. Framed backdrops (also known as pop up displays) benefit from the protection and rigidity that laminating films provide. The rigidity offered by a laminating film assists with graphic installation and helps display panels remain attached to vertical frame supports. Frame backdrop systems can generally accommodate heavier films than retractable displays, so the finishing options are extensive.